Shoutout to all my economics nerds. For those who are wondering who the heck this guy is who isn't Alecos who is posting about the Area 51 stats, the short introduction is that I remember using this StackExchange being in Beta when I was in undergrad, and then it got closed because of inactivity, much to my chagrin. Now it's been open again, so as a fledgling Masters student in economics, I have a new outlet for my burgeoning curiosity (read: serious procrastination) So I'm back in the game and grateful that this site is building up so much good content already. We're out of the red in all categories, so that is pretty sick! The long term trend for this site is that the number of visits per day seems to be rising consistently, as it becomes more known and as the school year shifts into full gear. The number of active users and questions asked seems to be going up significantly as well. 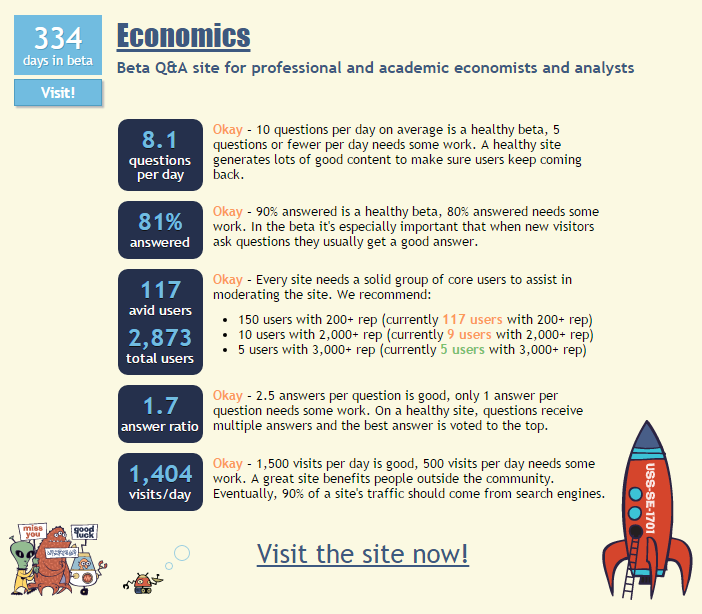 However, in all the previous Beta checks I see, we are continually hovering extremely tightly around ~80% of questions answered and 1.7 answers per question. If we're getting more users--more active users in fact--why is this the case? My guess is that once a lot of questions here are math based, so once an answer is out, there isn't much else to add to them, and it discourages people from adding additional answers. For places like the Math SE, it's not a big deal because they have a much larger community than ours, but for us, does this feel problematic? If there aren't enough questions to answer, then that feels like a ceiling for how many people can really be actively answering questions. We are getting more questions per day, but if that keeps growing at roughly the same rate as the number of avid users, then we'd expect that the number of answers per question will stay the same, which may hurt our chances of getting out of the Beta. We also have the same percentage of questions being answered. I noticed that a lot of questions that are asked are simple enough to be answered in the comments, and that is what usually happens to those questions. We are getting more of them, as the undergrads/high schoolers flood in. Should we, for those questions, at the end of whatever comment/chat conversation that comes out of that, try to post a summary post as an answer that neatly surmises what has been discussed? Is it realistic to say that this can be realistically done for many of these kinds of questions? If we did this, then we'd raise the average amount of answers per question and the percent of questions answered, but it might encourage poorer quality posts. So that is my second major topic of discussion. Also, something that I don't see too often on our SE, compared to other types of questions, is discussion on literature--and I know, I know, we're not specifically supposed to ask questions to generate subjective and broad discussion, but bear with me. The importance of economic literature should be addressed in a serious economics community I feel, especially an international one that wants to welcome a wide variety of economic thought. and so on, can lead to insightful answers about research methods or rigorous math in economics. A sharp economist would also, preferably, have some vague interest in some economic literature, enough to give a thought on current research papers and such. If we wanted to encourage questions on economic literature more actively, what guidelines would we want for those? The last thing I feel like I have noticed in my time here again is that the median number of votes a question will get is around 2-3 votes (rough eyeball), and usually less so for answers. Part of it is that answering new users sometimes doesn't yield votes from them or they might not mark an answer as accepted, which reduces "incentives" to answer these sort of one shot users. But how active do you guys and gals feel we are in our civic duty to vote on questions and answers? Reading through some old posts in the Meta, it seems that voting to encourage activity was sometimes lackluster. Finally, what ideas do you guys have for increasing output/SE productivity without arbitrarily inflating the activity. (heh i'm so topical) Personally, I'm encouraging people at my university to join in the fun and thinking of posting more solved questions, to add content to the place, but do you agree with my thoughts I've written? Are there other causes for our trends that can be remedied? The rules for graduation have changed. It's now all about questions per day. That's not to say that any questions are good: we're looking for questions about real economics problems that people face. And that's not to say that more users isn't good: we do want a growing body of users, in particular of experts. Furthermore, we absolutely need users who will get involved in caretaking of the site: flagging bad posts; up-voting, down-voting, voting to close, to reopen and to delete as appropriate. Because its those caretaking activities that will prevent this beta from getting closed. And it's not that we don't want more answers: when people get great answers to their questions, they - and anyone who sees the Q&A - will come back with more questions. Not the answer you're looking for? Browse other questions tagged discussion site-activity .